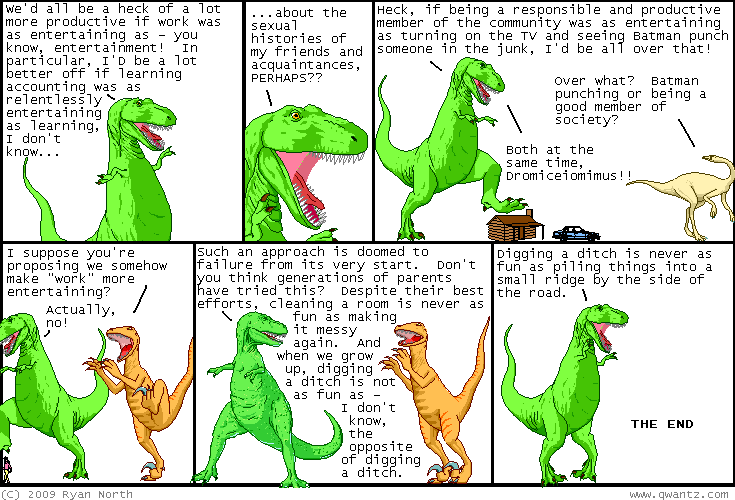 Dinosaur Comics - May 1st, 2009 - awesome fun times! May 1st, 2009: What day is it tomorrow? It's Saturday, May 2nd, which is also FREE COMIC BOOK DAY! Free Comic Book Day, you guys. Show up at any comic book store and they'll give you some free comics. Hugh Jackman approves! I'll be at The Beguiling on Saturday to pass out comics, and if you can't make it there, be sure to pick up Comics Festival (the one with Sardine on the cover!) as a free comic because there's tons of great comics in there and one of them is by me, Ryan! From the internet! One year ago today: when writing parody lyrics, it helps if your new lyrics have a meta-textual rhyme with the original lyrics, as this reminds readers of the actual song. this is a New Theory i developed while writing this comic.